Have you ever purchased stainless steel jewelry? If the answer to these questions is "yes," then the innovation of Indiana has affected your life. All of the aforementioned products were invented by Hoosiers with dreams that they made reality. Hoosiers have had a long and exciting heritage of invention. The ideas that have been developed in this state have gone on to affect the world. 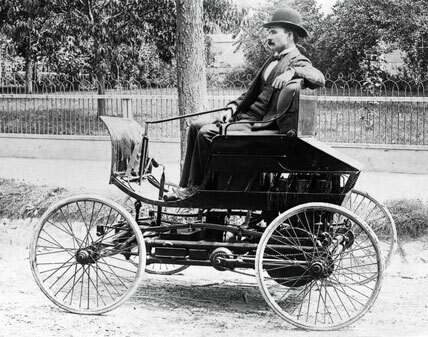 Few know the first automobile was invented in Kokomo by Elwood Haynes. Be it little inventions like the "pop-top" to a can of soda which was invented by a Muncie farm boy, a method for the mass-production of penicillin developed by a man from Star City, or an improved trumpet mouth piece which spurred an industry driven by an Elkhart local, Indiana has made a substantial impact on the workings of the modern world. Hake '08 is from Fort Wayne, Indiana. In top photo: Elwood Haynes in his first car in 1894.